June's birthstone is pearl, so I cannot pass up the occasion to showcase a few special pearl sources and deals. The marvelous designer Zara Scoville of Priceless Imperfection is now offering two dozen pieces (necklaces and earrings) on etsy. 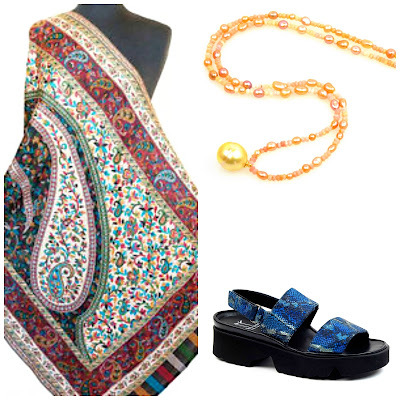 I'm a fan of her boho-chic pearls, and Zara is a delight to deal with. 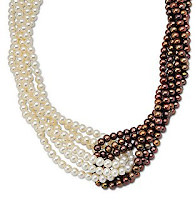 Shown, the hip yet refined natural coloured pearl necklace with rough diamonds on 14k gold chain, $450, a fabulous way to break the boring-bead mold. Crisply chic, this 18" white and chocolate pearl torsade will sharpen a white shirt. The price, just $95 (and free shipping in the US) at Ross Simons, also makes it a perfect June birthday gift. Or one for you, one for her. It's only $85 in the 16" length, and is also sold as a 20-inch piece for $105. 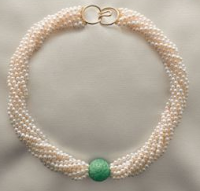 Pearls, gold and jade are classic and elegant; the ten-strand pearl and carved green jade bead necklace with a 14k clasp from Gump's could mark one of those special "0" birthdays; $2,000. The hint of mystery, the quality of fabrication and the Asian references are compelling to me; I keep returning to look at this necklace again and again- heirloom material. Kojima Pearl's Cleopatra Necklace elevates wedding pearls from sweet to siren; a bride could wear this delicate web with everything thereafter. 3.5mm Chinese freshwater pearls are spun on rhodium-plated silver links, so it will not tarnish. The 19" length is adjustable to wear at 16" or 17"; the front width is 1.75; and the piece tapers toward the clasp to a half-inch so it will sit gracefully. Great pearly presence for only $230. I'd pick Kojima's braided leather and Tahitian pearl bracelet for a lucky graduate, a friend who thinks she's too casual for pearls, or me, me! Supple woven goat leather with five natural colour Tahitian pearls (10.5 to 11 mm) strung along the 7.5-inch bracelet. Pearls with 'tude, $288. 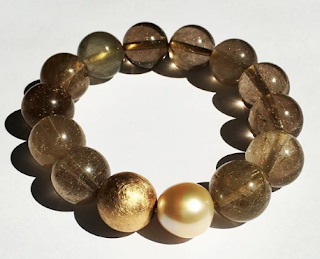 If you don't actua lly want to pay for pearls, and feel lucky, enter Pearl Paradise's contest before the end of June for a chance to win their luscious and luminous 11-13mm flameball freshwater pearl necklace, which is worth $700. Give 'em you e-mail addy and cross your fingers! 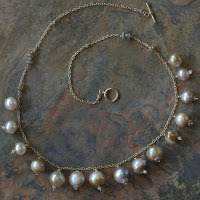 Just had a 3 strand coin pearl necklace custom made for me at leftbraindesigns from etsy! It arrived yesterday and I'm wearing it today. I'm very pleased--they are hand-knotted and exactly what I envisioned. I love pearls, and have been desirous of coin pearls for some time. It is my late mother's day gift to myself. Funny that I didn't even know they were June's gem. 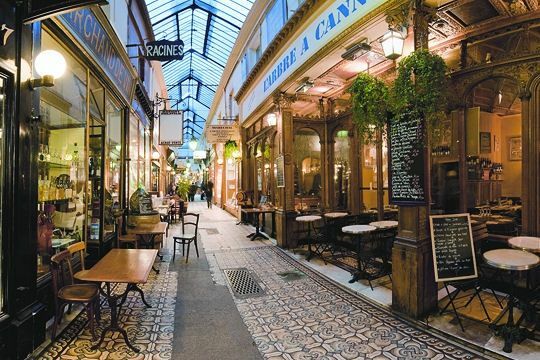 spacegeek: Yum! If you have the same coins that are on the site (the three strand with the tourmaline beads, listing http://www.etsy.com/view_listing.php?listing_id=21433078 ), you have beautiful pearls. Coins show off the superior lustre and nacre of freshwater pearls. Pearls are wonderful. I only have one necklace, a multicolor one with huge pearls. I like the ones on pictures 1 and 4. They would be beautiful gifts for someone younger than me. I understand you liking the`heirloom necklace´. It has a bit of the grandness that is only proper for those of us who are in the certain age,yes?